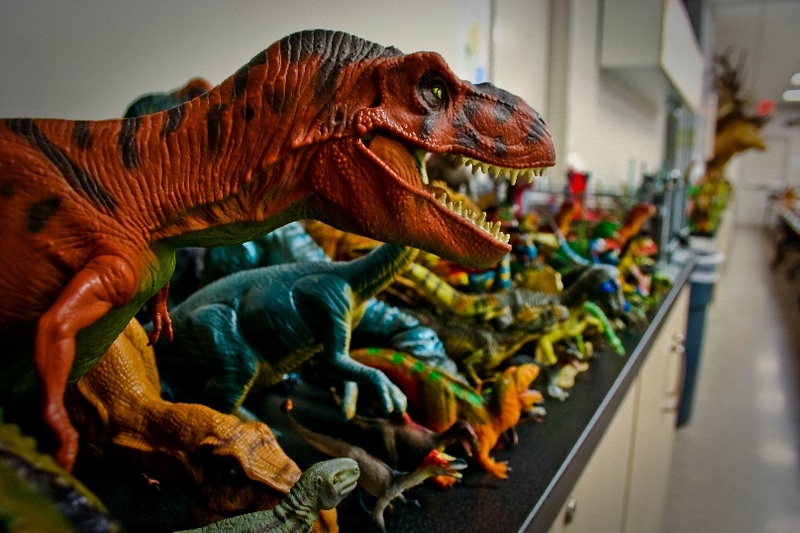 With the exception of our feathered friends, dinosaurs are all but gone today. So what are the ways to connect to these long lost creatures? Well as a child I had three options — museums, media and models. Going to the Houston Museum of Natural Science and standing in the shadows of the fossilized skeletons gave me a sense of their size and majesty. Dinosaurs in the media consisted of news stories, articles, documentaries and books. 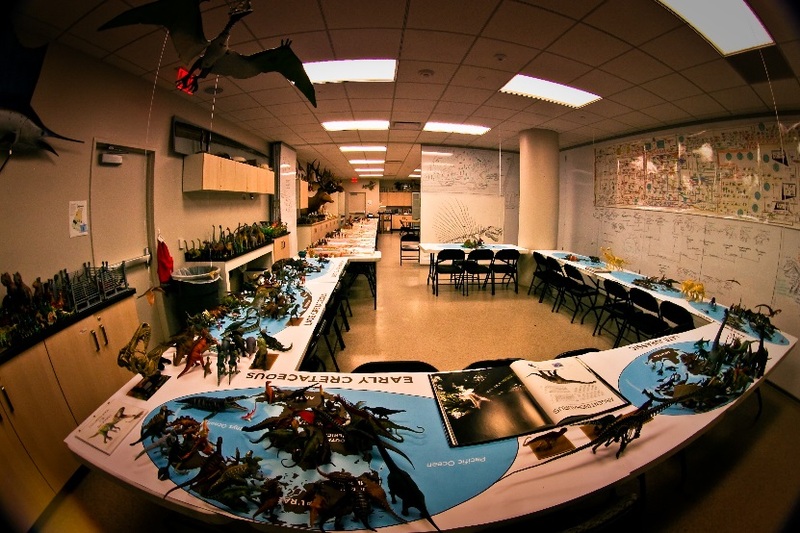 But the models (or toys) were the third part my mind needed to fully imagine these masters of the Mesozoic. For some reason holding a model of the animal in my hand gave my mind the final ingredient to fully imagine dinosaurs as they might have looked. As an adult I have the honor of working at the museum as a Discovery Tour Guide specializing in the Morian Hall of Paleontology. I literally get to go to the museum five out of seven days a week! I have traded in my documentaries for scientific text books and published journals. And although I stopped playing with the toys, I still collect them, using them as models in contrast to the actual fossils upstairs. Which brings me to the point of this article. In the age of the Internet and easily accessible museums and colleges, how is it that certain tour companies can make inaccurate models? It may seem minor to an outside observer, but the number of fingers and toes or the lack of a crest are some important ways to make a species identifiable. For the record I am not commenting on fictional dinosaur-like creatures such as Godzilla or the Indominus Rex from the movie Jurassic World (2015). Or the changes made through time, such as the orientation of the necks and tails of Sauropods (long necked dinosaurs) like Diplodocus. Or how Velociraptor toys have no feathers in the early 1990’s. Those toys were made with the accepted science of the time, though now we know they were wrong. 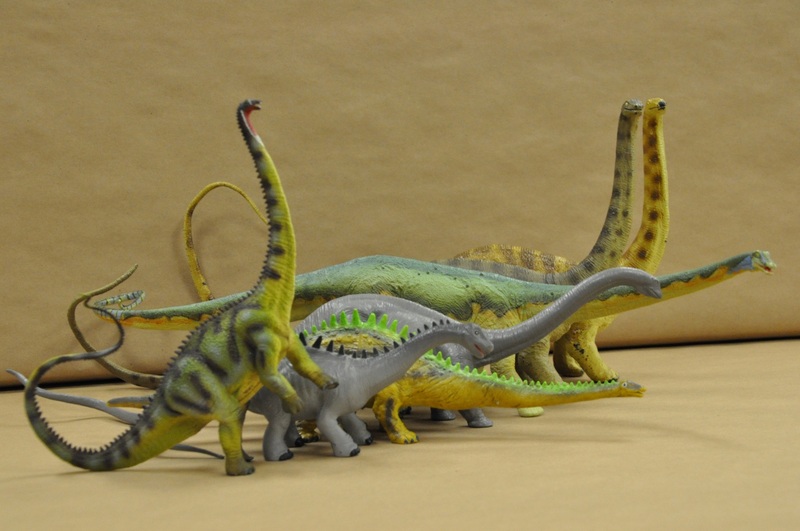 I am also not considering how some dinosaur toys are made cute for preschool-age children. My remarks are on toy companies that claim to make scientifically accurate toys/models in the 2000’s without certain diagnostic features. Diplodocus through time. Manufacturer and year produced from left to right: Collect A 2013, K&M 2004, TS 2001, British Museum (Natural History) 1974, Safari Ltd 2006, Safari and later Carnegie 1988. As displayed by the image above, Diplodocus has seen a variety of modifications in the toy and model world. Yet each model maintains its long, whip-like tail, narrow horse-like face, hind legs longer than forelimbs and general slender form when compared with other Sauropods. No matter the incarnation, you know it is Diplodocus. Another easy example is the genre Stegosaurus, which has three toes on its hind limbs. This feature (narrow pillar-like feet) indicates Stegosaurus lived in a dryer or at least more solid surface and not in swamps. So when I see a Stegosaur toy or model with the five standard toes of lizards, I can’t help but wonder why they didn’t take the time to consult someone, anyone, in the field of paleontology before they began production. It’s like making a modern rhinoceros toy with rodent feet or giving a giraffe zebra stripes. Just google “Stegosaurus skeleton” and the number of toes is consistent on pretty much all the images. The many faces of Stegosaurus. 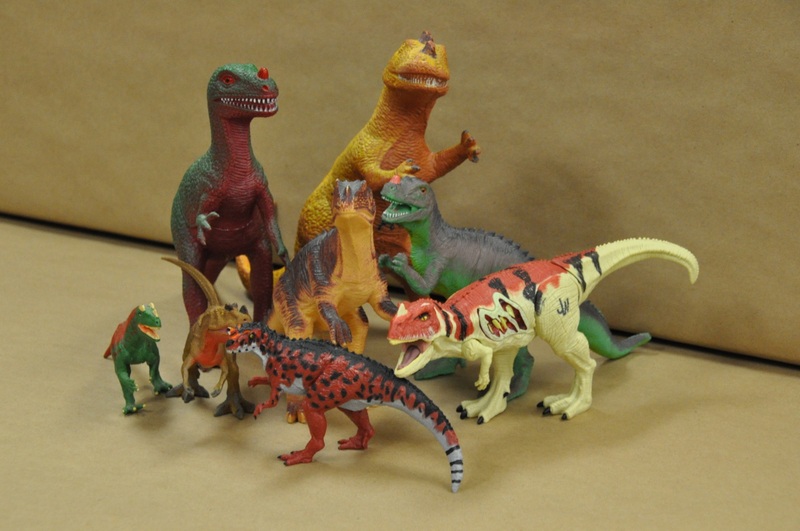 Manufacturer and year from left to right: Toy Major Trading CO. LTD. 2008, Jasman 2001,Dur Mei 1986, Jurassic Park’s Kenner 1993, The Lost World’s Kenner 1997, Safari LTD, Dino Riders 1989, Papo 2005, Dinosaur Valley 2005, Safari 2007 and K&M 2004. 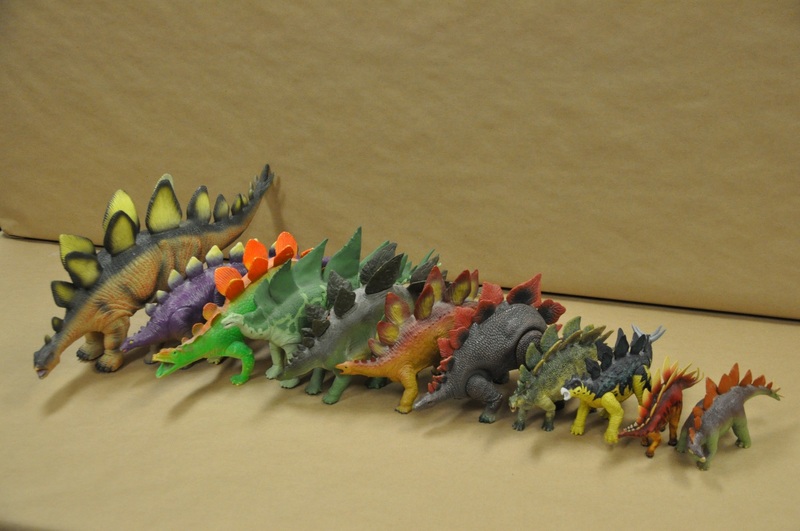 Of the eleven Stegosaur models/toys in the above only four have the correct number of toes! Dino Rider 1989 (surprisingly), Papo 2005, Safari 2007 and K&M 2004. The two on the far left of the picture have five and the rest have four. What I find most surprising is the fact that Safari put out two different figures with different numbers of toes? Mosasaurs show me those pearly whites! Manufacturer and year from left to right: Safari 2010, Carnegie 2008, Papo 2012, Collect A 2009 and Mojo 2010. Mosasaurs are the marine reptiles of the upper Cretaceous period that were made even more famous by Jurassic World. Although the movie made the animal too large, they did get one thing right. Mosasaurs, like pythons, possess a second row of teeth inside their jaws. Only one of five Mosasaur models have that iconic feature. The 2008 Carnegie model seen second to the left is the only one with the correct dentition. When I show this feature to museum guests on tours, they are shocked and amazed! 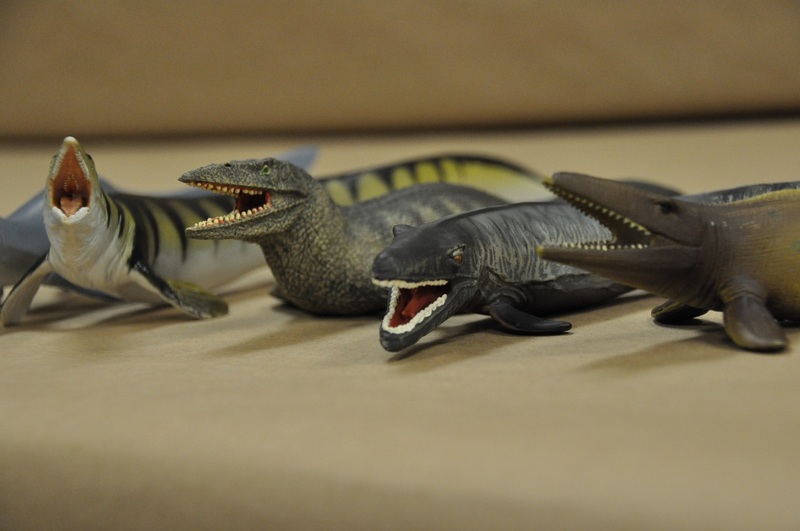 I can see why now — 80 percent of Mosasaur toys in the mainstream market lack that feature. But know that the Jurassic World Mosasaur has the teeth, which can be seen when it eats the poor British woman who did nothing wrong. Unfortunately the Jurassic World Mosasaur toy (which I do not have yet) neglected to be consistent with their own movie. No second row of teeth! The figure with a purple hide and pink nose horn is labeled Oviraptor. Which is almost a felony if you knew anything about Ceratosaurus or Oviraptor! The toy is manufactured by Boley, who is known for putting out mislabeled figures in the world of fast and furious dinosaur toy collecting. But it does have the nose horn and four fingers. If it had two eye crests it would be a good example (in toy form) of Ceratosaurus. Too bad it’s labeled Oviraptor. In front on the right is the Jurassic World Ceratosaurus. It has a nose horn, two crest-like projections over the eyes and four fingers. I know it’s not said very often, but good job Jurassic Park franchise on your scientific accuracy. The medium figure in the middle with a red hide and yellow underbelly is from 1998 (hard to read the stomach). The horn and crests are good enough, but it only has four fingers. Missed it by that much. I saved the best for last. The three small figures on the lower left are, from left to right, Safari 1996, Safari 2012 and Terra 2015. All three figures have the correct horns, crests and finger counts! In short, buy the smaller more detailed models. But there is a silver lining. As you might have noticed there is an attempt to correct these mistakes over time. And the Boley figure to the left tells it all. When this very same figure was produced in the early 2000’s it was labeled Metriacanthosaurus. Metriacanthosaurus was like a Ceratosaurs without horns and a small sail running down its back and tail. Later the name was changed to Edaphosurus. This was close but still wrong, but they at least classified it outside the dinosaur clade. The animal the toy represents is a relative of Edaphosaurus. Unfortunately, an Edaphosaurus has a smaller skull and a sail of a different shape, and the spines have small projections. 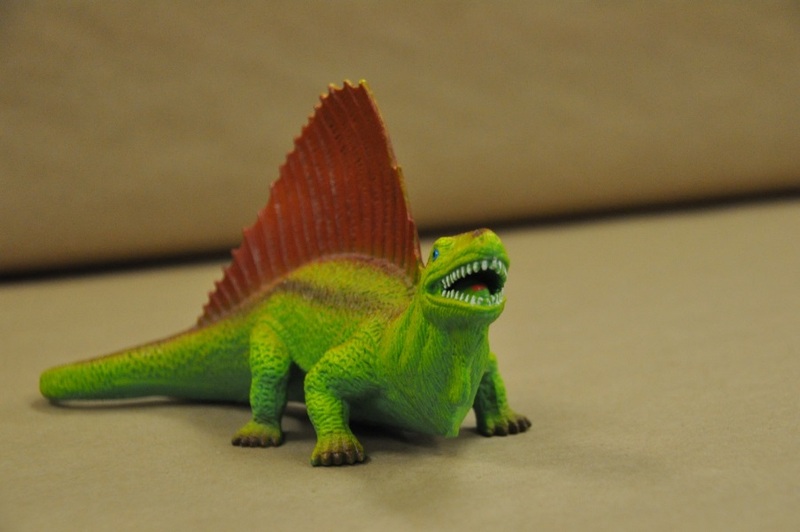 But one day, one glorious day, I saw this figure label Dimetrodon. A victory, no matter how small. After two failed attempts, Boley finally got it right. The third time was actually a charm! Now I know you may think of me as a grown man obsessed with dinosaur toys, and you are probably right. But my fiancé thinks it’s cute. She considers it better than collecting motorcycles or gambling. All I’m saying is many people go to college to earn degrees and/or commit countless hours to understanding the exact morphology of these long-extinct animals. And for a toy company to barely attempt to fact check an educational model that they sell to children? It’s just unacceptable. Imagine a store selling toy tigers with stripes and lion-like manes, whales with gill slits and blow holes or sea lions with long floppy rabbit ears. And that weirdness is what plagues comments. Thank you. Editor’s Note: Watch for a special exhibit opening in the Morian Hall of Paleontology Feb. 19! Amber Secrets: Feathers from the Age of Dinosaurs offers a glimpse back in time to the forests of Burma in middle Cretaceous, when plants were just beginning to develop flowers. See extinct insects trapped inside fossilized tree resin, and an astounding surprise: feathers in the time of T. rex and Triceratops! James is a Discovery Guide at the Houston Museum of Natural Science. Well written, James! And a gauntlet thrown down to the toy companies! Now you have gone and done it James. The real challenge now is for you to design a line of morphologically correct dinosaurs, unless you have already done so in the two years since your original post.